Step 1. Define the underlying mortgage pool. Step 2. Calculate underlying pool cash flow. Step 4. 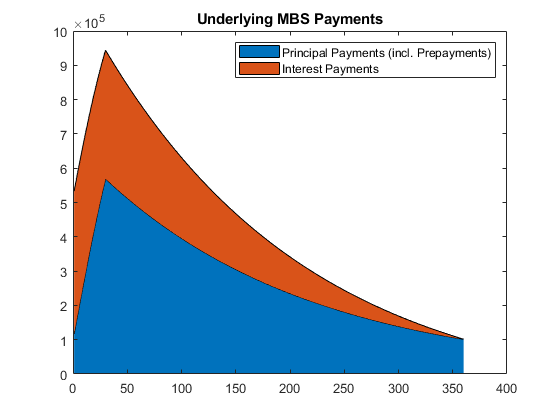 Generate a plot for underlying MBS payments. Step 5. Calculate the PAC schedule. Step 6. 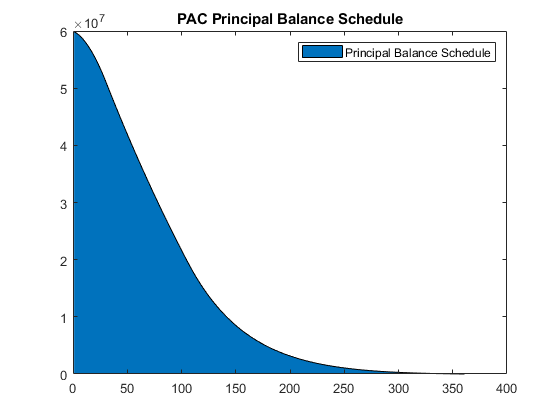 Generate a plot for the PAC principal balance schedule. Step 7. Calculate PAC cash flow. Step 8. 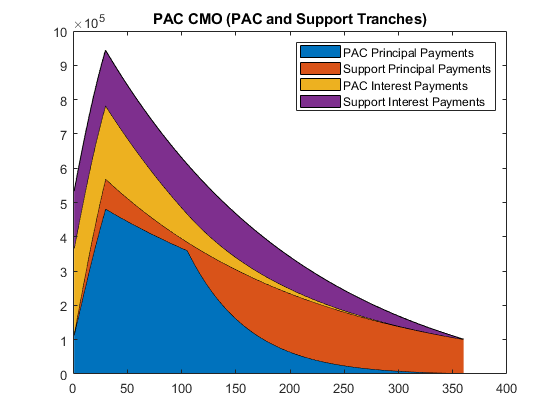 Generate a plot for the PAC CMO tranches. Step 9. 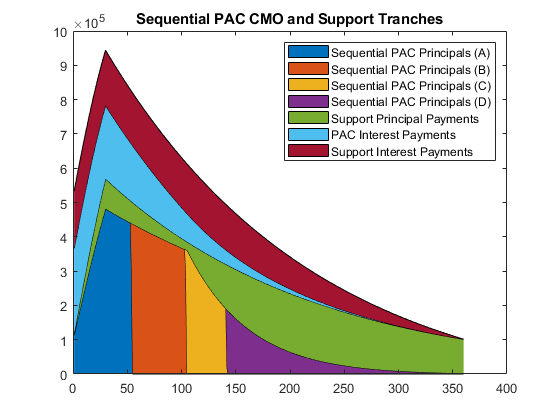 Create sequential CMO from the PAC bond. Step 10. Calculate cash flows for each tranche. Step 11. Generate a plot for the sequential PAC CMO. Step 12. Create the discount curve. Step 13. Price the CMO cash flows. This example shows how to use an underlying mortgage-backed security (MBS) pool for a 30-year fixed-rate mortgage of 6% to define a PAC bond, and then define a sequential CMO from the PAC bond. 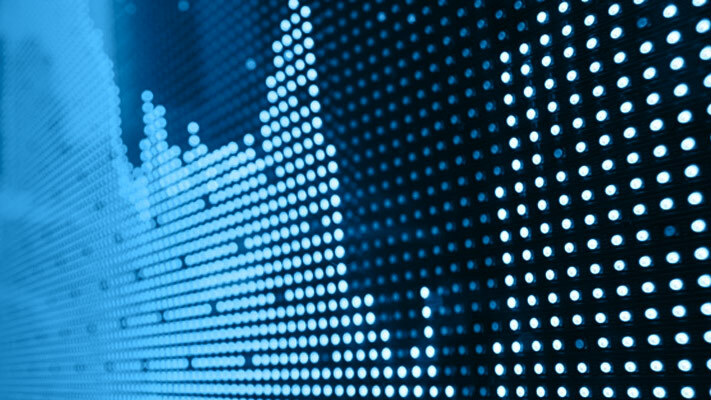 Analyze the CMO by comparing the CMO spread to a zero-rate curve for a 30-year Treasury bond and then calculate the weighted-average life (WAL) for the PAC bond. The cash flow for the sequential PAC principal A tranche is calculated using the cash flow functions cfbyzero, cfyield, cfprice, and cfspread. The weighted average life (WAL) for the sequential PAC principal A tranche is 2.54 years.